Maybe Singapore has it right. It induces heavy fines for possession or use of chewing gum without a prescription. 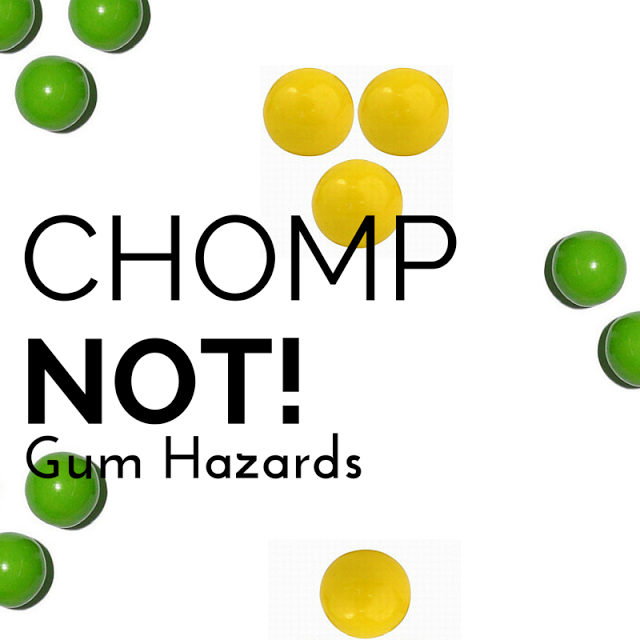 That may be a tad severe, but I, personally, find it to be an undesirable view – watching and hearing someone smack and chomp on a piece of gum. And, after learning some things and reviewing a few chewing gum labels lately to see what was there, the sound of it may turn you off, too. Besides getting stuck on your shoe, here are other ways chewing gum can annoy your body. Lots of links to tap here for more research details. 1. The ingredients are scary. There is nothing sweet about artificial sweeteners and chewing gum is loaded with them. A common ingredient in sugar-free gum is aspartame. It is metabolized inside your body and may cause serious neurological as well as other harmful effects. It is FDA approved but many studies show it has been linked to birth defects, cancers, brain tumors, and weight gain as well. Why take the risk? Sucralose or Splenda, another common artificial sweetener used in chewing gum and FDA approved, (but based on only two human studies) has shown to reduce the absorption of other drugs, cause stomach distress, release toxins when used in baking as well as many other harmful effects. Another common preservatives listed in gum labels is BHA (butylated hydroxytoluene), a preservative that has a whole host of bad associations such as cancer and many other diseases. Don’t miss this: A great way to shop for fresh and nutrient-dense fruits and vegetables is your local farmers’ market. Here is a guide to make it a smart way to shop with tips to ask your grower to ensure your foods are organic and not sprayed. 2. There is no entrance fee. The fact that chewing gum is not swallowed does not give it a pass as to the ingredients being absorbed as they enter through the walls of your mouth. Some even claim it could be worse as the ingredients in gum enter your body quickly bypassing the digestive system that might filter some of these ingredients away. 3. Fake colors are not true. The artificial colors in many gums, especially those for children, may lead to hyperactivity or magnify symptoms of attention deficit disorder. There is also some studies that indicate that certain food dyes may lead to cancer as well. Don’t miss this: DId you know there are foods that can actually calm your nerves? 4. Your digestion is adversely affected. Chewing gum causes you to swallow excess air, which can contribute to pain and bloating and exacerbate IBS symptoms. Further, those artificial sweeteners, like sorbitol can lead to several GI problems like cramping, gas and even diarrhea, too. 5. Gum can go to your head. Recent studies have linked the chewing of any type of gum with migraine or tension headaches in adolescents. Don’t miss this: Could those headaches be a migraine? Find out here all the specifics on that. 6. Excess smacking and chewing hurts the jaw. Many complain that gum causes their jaw to click which could lead to disorders that cause tightness of the jaw muscles. 1. Nibble on an herb. 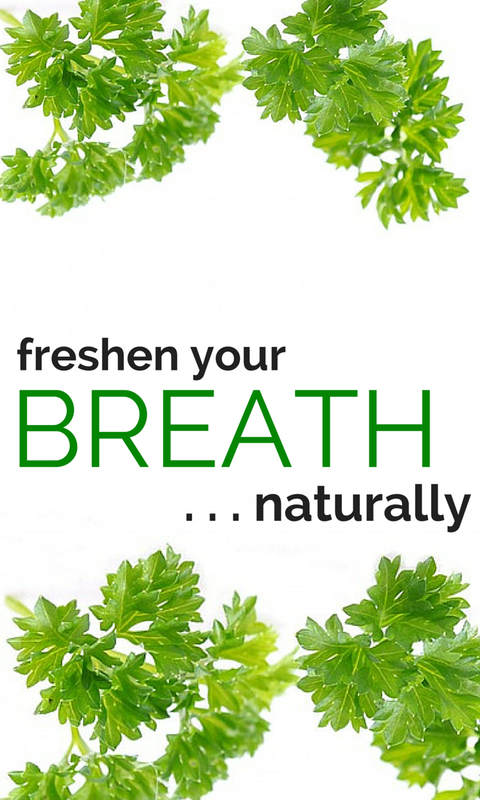 Parsley and mint as well as other garnishes are great natural breath fresheners and probably more effective in achieving the task over gum anyway. Besides, they both contain a plethora of nutrients! Don’t miss this: Check out how to cook best with these other amazingly healthy herbs and spices. I wrote about the many reasons and benefits of drinking lemon water, but one big benefit of keeping your body as well as your mouth hydrated is that it chases away any bad breath you may acquire. Don’t miss this: Browse through these endless other healthy sips, sauces, and smoothies options, too. 3. Pocket a few seeds. Keep some fennel seeds in your pocket and chew on a few after a meal as an alternative to chewing gum to keep the breath nice. It has the additional benefit of containing antibacterial properties. So, what do you think of chewing gum? Is it something you do often? Or do you have other alternatives? Note: This post appeared previously on THM but has been updated with latest links. Gum can help keep mouth moister and that can help with dental issues, Deborah, but the chemicals that are in it are really not a good thing to ingest! Drink water to keep your mouth hydrated instead and infuse it with whatever flavors you love – mint, citrus, cucumber – much better choice and so much cheaper and easier! Wow, I do chew gum too much, and I can attest to the headache effect. I didn't know about so much of the other detriments, though. Thanks for sharing this informative post in #ThePinterestGame! Sorry to hear of headaches but good you have made the connection with gum. Thanks so much for telling us your experience. So great when readers join in like that! Really good thanks for shining the light on gum. You are welcome, Kathleen! Glad you learned something here and many thanks for coming by! I hate to blow any bubbles on anyone’s fun, but it really can be alarming what is in those gumballs! So happy I shed some light. And, you are kind to share. Always appreciate that. Cut back a little bit each day would be good! I wish you the best with breaking that habit, Liz! You come up with the most interesting posts, Lori! I'm not a big gum chewer, but I do have the occasional stick to freshen my breath … when out, for example. I'll definitely think twice now! I do like your idea of chewing on a few fennel seeds. Great idea! Hi Helen – Kind words! Thanks so much. I got the fennel idea from a local Indian restaurant that does that at the end of a meal and it is nice! Thanks so much for dropping by! I had no idea that chewing gum had so many detrimental effects! This was a huge eye opener for me – I'll think twice next time for buying a pack at the checkout! Thanks! Hi Ceara! Thanks for coming by and hope the information shed some light!